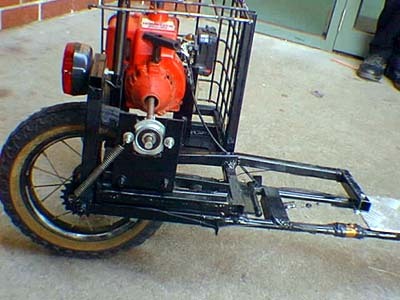 This scooter is a basic friction drive system with a standard whipper snipper motor. 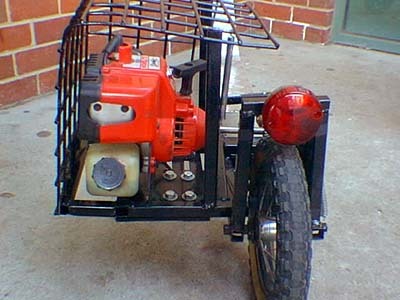 To get thing thing going all you have to do is lever the motor off the wheel give yourself a few pushes and then drop the motor back down. There was a few things we had to get the engineer to do for us. We had to get the shaft coming from the flywheel extended, it doesn't matter how long it is just as long as it is long enough to go across the whole chassis and join up with a bearing at the other end. The bearing was there to support the shaft by distributing the force to two points instead of one so it didn't snap off at the motor. We also got the engineer to make the spindle because originally we were going to use a rollerblade wheel which went over the top of the spindle that we now have on it. 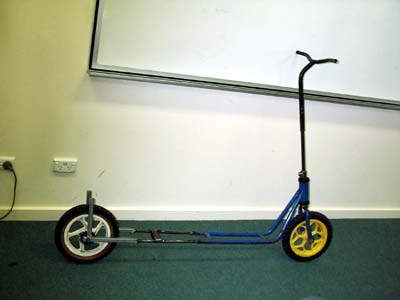 Our ratio is 10:1 the wheel being 30cm and the spindle being 3cm. 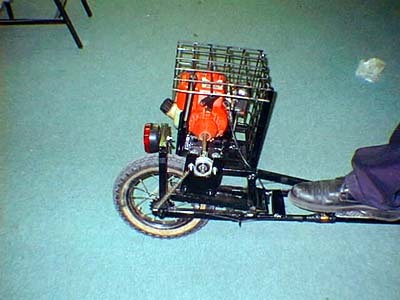 As you can see we have had to design the scooter so it had something to act as a clutch because there wasn't one in the motor already. The idea we came up with was to join the whole bracket to the chassis using a heavy duty hinge. 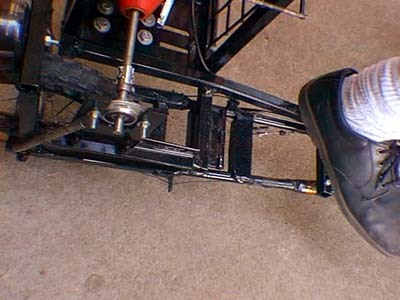 When the pedal is stepped on it levers the motor off the wheel, as soon as you release your foot off the pedal the spindle is forced back onto the wheel using a spring located near the bearing. Because we were unsure of how hard the spindle would have to be pressed onto the wheel be made the plate with slits in it so the motor could be slid along and then bolted into place. Because the position of the motor can be altered we had to make it so that the bearing position could also altered, so the shaft was always at 90 deg with the motor. The spindles position can also be changed, the spindle simply slides down the shaft into place and then is secured with a small screw. 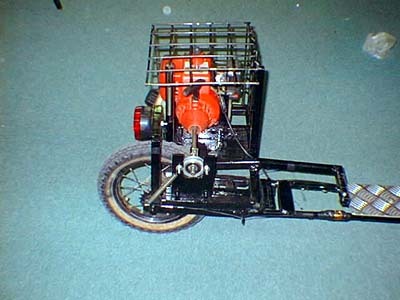 The cage is simply there to protect the motor and also because it had to be as safe as possible to pass the subject. We have made the cage so it can be opened incase the motor has problems using another heavy duty hinge, it is secured by a spring which pulls the cage down to hold it in place.